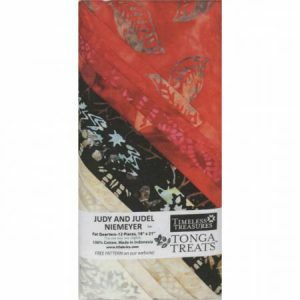 I have always loved Judy Niemeyer designs but didn’t have the time to make many of her larger projects. That is why I am loving these smaller ones that showcase one technique and, in some cases, can be done in an afternoon. 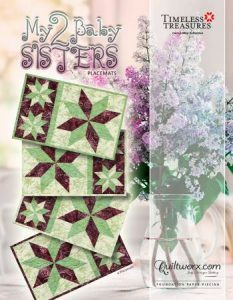 My Two Baby Sisters showcases two six inch blocks and a twelve-inch block which use the exact same technique to create this eight pointed star. What a great class! Who doesn’t want to learn how to make these blocks without fussing with inset and Y-seams? Additional papers are available because you know these will become go-to gifts. 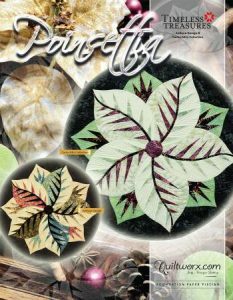 This Poinsettia design makes piecing circles simple – and at 30″, is the perfect centerpiece for a round table. Once again, additional papers are available. Fractured Star in an 80″ square. 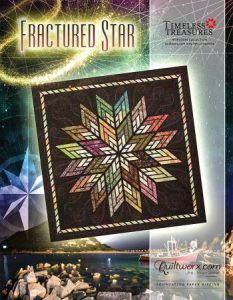 In Judell’s words: The Fractured Star was designed as a beginner pattern to introduce quilters paper piecing. 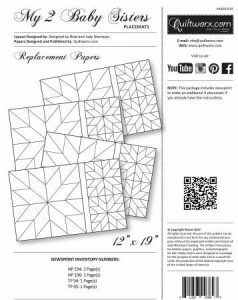 The project is fast, uses only 1 foundation block, employs simple cutting techniques, and is an affordable and fun way to jump into your first paper piecing project. It is meant to make those new to the process find confidence, understanding, and success. I can’t say it any better than that so why even try??? 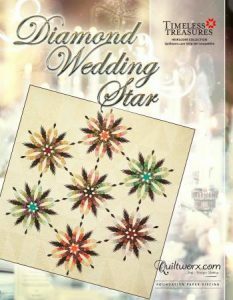 These patterns are due to arrive in August so consider them for your Fall series of classes! This seven sisters setting of a Diamond Wedding Star is breathtaking – a perfect example of when less is more! And the perfect fabric choices? 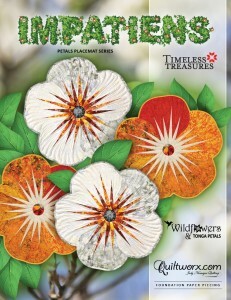 This heirloom strip set by Timeless designed, or course, by the Niemeyers! Check out these Market releases! 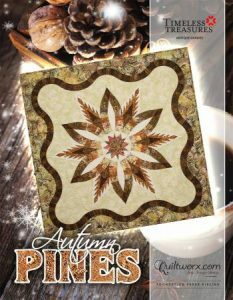 When quilts become art – Autumn Pines can be the focal point of any room. 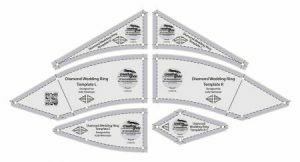 These quilts are the newest additions that feature the Diamond Wedding Ring templates by Creative Grids®. 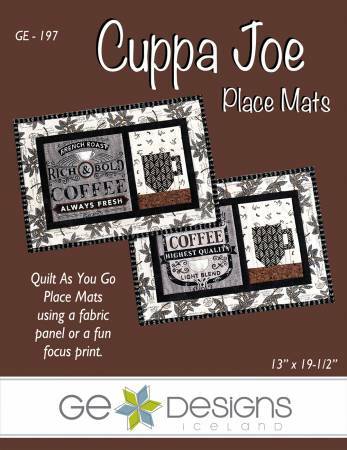 Why not combine the new with these classics from Cut Loose Press and Quiltworx? 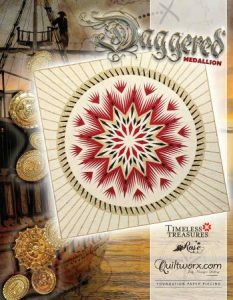 These newest medallion quilts are stunning! Frankly, it is hard to come up with adequate descriptions for her quilts! And in these colorations? Wow! The circular designs soften all of the angles. Don’t you love the border treatments? Just one of these masterpieces will be the centerpiece of any room! Why not order yours today??? The red and white quilt craze has been wildly popular since the Red and White exhibit in New York, but finding true reds to make these quilts has NOT been easy. And, batik red, whites, and blacks? Non-existent so you know the book, pattern, and soon to be released fabric line are instant winners! Spring Market was Blooming with Quilts! 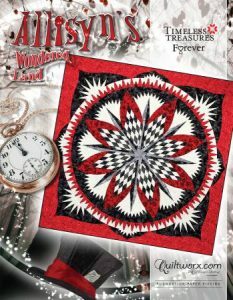 I LOVE these new patterns by Quiltworx. 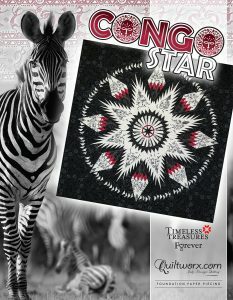 Each pattern provides the opportunity to teach Judy’s classic techniques by creating a smaller project that can be completed in one sitting! The Impatiens pattern (#JNQ00215P1) provides enough papers to make (4) five-petal flowers that are 18″ in diameter. 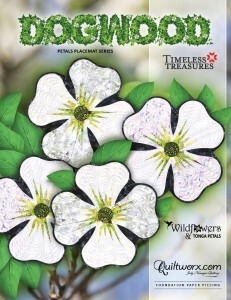 This floral series is the first time that they have included the quilting designs on newsprint with the pattern so you can trace it right onto your finished petals. Don’t let the shape intimidate you. 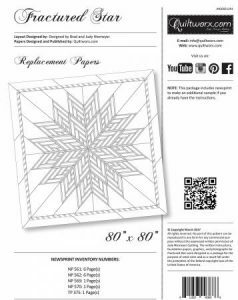 The pattern includes a link to a video featuring Judy showing you how to bind these beauties! 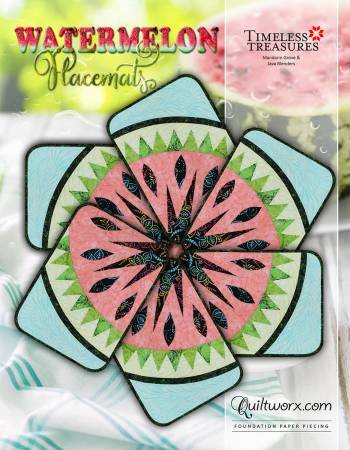 The pattern includes (4) Stitch-N-Peel Flower Centers – it can’t get any easier than this! 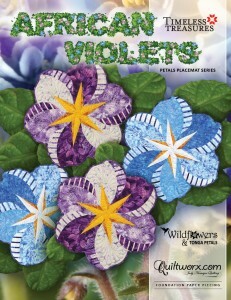 The Dogwood (#JNQ00215P2) and African Violets (#JNQ00215P3) provide enough papers to make (4) four-petal flowers as well. 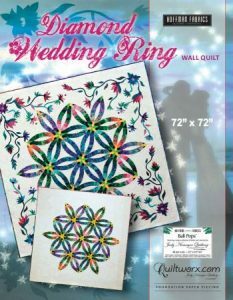 They also include patterns for machine quilting and the floral centers. Remove the intimidation factor by watching Judy bind the flowers. 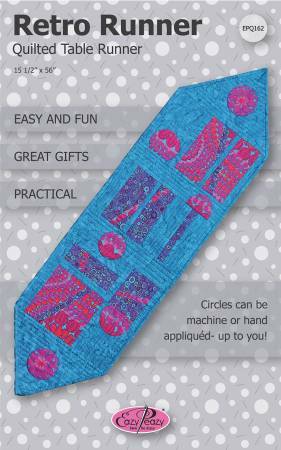 All three patterns are fat quarter and yardage friendly so they are easy to kit. Why not let your customers choose their own gardens by ordering all three? They will be arriving this month – just in time for summer classes! 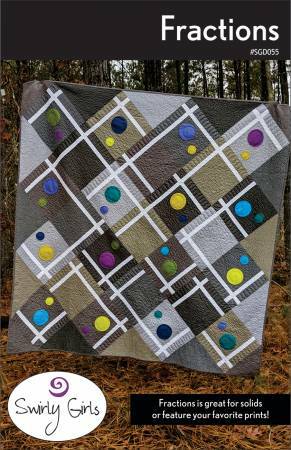 Judy Niemeyer just posted some pics of a new Diamond Wedding Quilt she was working on – which led to several photos of finished quilts. Her color choices are striking! These quilts look totally different in different colorways. I love the striped, diagonal border. 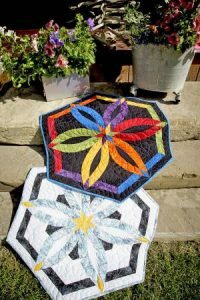 The appliqued flowers enhance the circular motion of the quilt. The original uses the appliques to accentuate the square. Look how the quilting turns this quilt into a work of art! 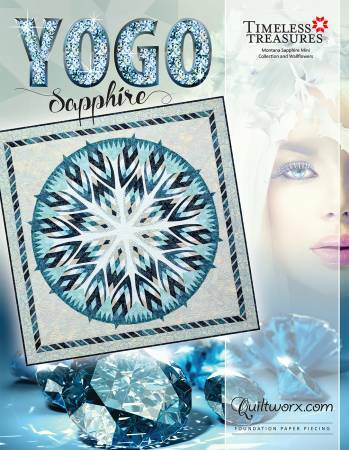 These intricate shapes can be cut quickly with the Creative Grids Diamond Templates. 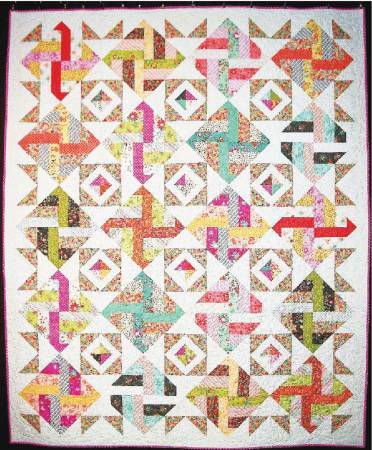 Make a simpler version of this quilt with this Cut Loose Press pattern. What a striking table topper! This version requires Pack #14 of the Charm Elements. View the video to see a demonstration by Judy – always a treat! Whether you make one ring or seven, the end results are breathtaking!